Is it time for you to review the security of your home or business? If so, we’ve got the tips you need to make sure your information stays confidential. When it comes to storing documents, less is more. We recommend taking the time to go through your receipts, applications, insurance forms, bank statements and more to determine what hard copies you really need to keep. Put them in a locked place in your home or office to keep your information safe. Consider shredding everything else to ensure the other documents don’t fall in to the wrong hands after you dispose of them. When you go out, only take the identification and credit cards that you need. Leave the others at home, and only take out cards like your Medicare card when you’re actually going to need them. Make sure you are checking your mail daily! Otherwise, you’re opening yourself up to the risk of a breach in confidentiality. Consider getting a secure box at the post office, putting a lock on your mail box and putting your mail on hold when you are away for more than a couple of days at a time. Passwords are designed to protect your personal information, but they only work if you make sure they’re properly secure. Consider using a password vault that will generate and remember strong and unique passwords. Alternatively, pick a memorable phrase and choose a number or letter to denote each word in the phrase. When it comes to security questions as back up to your password, for example ‘what is your mother’s maiden name?’, consider using a fake answer. Giving away personal information like that on a website could open you up to unwanted safety risks. We recommend limiting information shared on social media. The more information you share online, the easier it’s going to be for someone to get their hands on it. The people who need to know your birth date, email and phone number already have them! If you care about your privacy, don’t share these details online. We all keep the majority of our personal and business information on our computers these days, so it’s crucial to make sure you secure your personal account and the computer itself with a strong password like the ones mentioned above. This will protect your information from any intruders or if your laptop gets stolen. Think twice before you dispose of an old computer or phone. If it gets into the wrong hands, the security of your information could be at risk. Make sure you wipe the device completely before giving it the toss or trust a secure disposal company with the job. They can destroy your old computer or phone in a secure environment and will ensure complete destruction of any sensitive information. 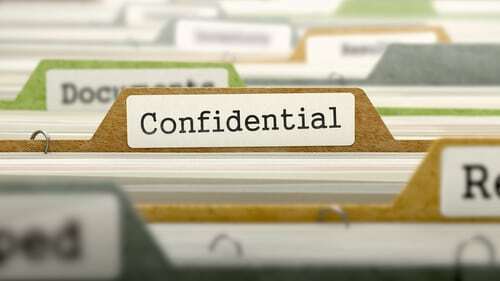 If you’re located in Melbourne, In Confidence can assist you with secure document shredding services. Whether you’re disposing of an old laptop, sensitive documents or large quantities of old paperwork, In Confidence can process your waste in a secure environment to ensure your private information stays private.